Custom Lacrosse Pinnies - Collegiate Cut Sublimated Jersey - Design 3 Lightning Wear&apos;s Dimple mesh poly collegiate cut custom sublimated reversible jersey. Dye sublimated pinnies in Adult and Mens and Youth sizes. 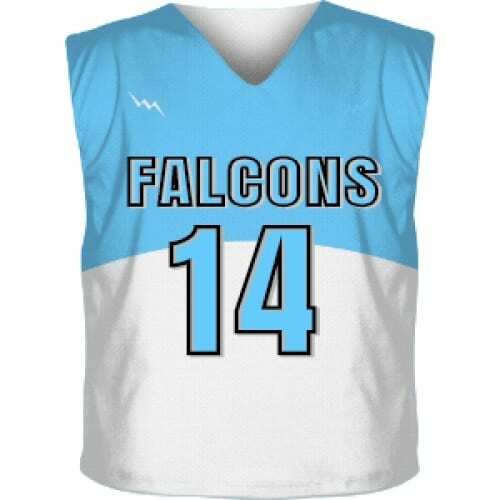 Collegiate Cut Sublimated Reversible Jerseys can be customized to your specifications. Get a matching set of custom sublimate shorts and team shooter shirts. Personalize with custom name and number. Team discounts are available. This is loose fitting and made to wick moisture. Printed, cut, sewn and shipped from Kensington, Maryland. Call today for a team quote. Sublimated Reversible Jerseys. Design custom lacrosse pinnies!